Baby Juno’s room is almost complete! For now, the furniture is set up and the crib has a canopy hung above it, which doubles as a “mobile” for baby to look at. This set of 3 different sized paper lanterns from Amazon.com. 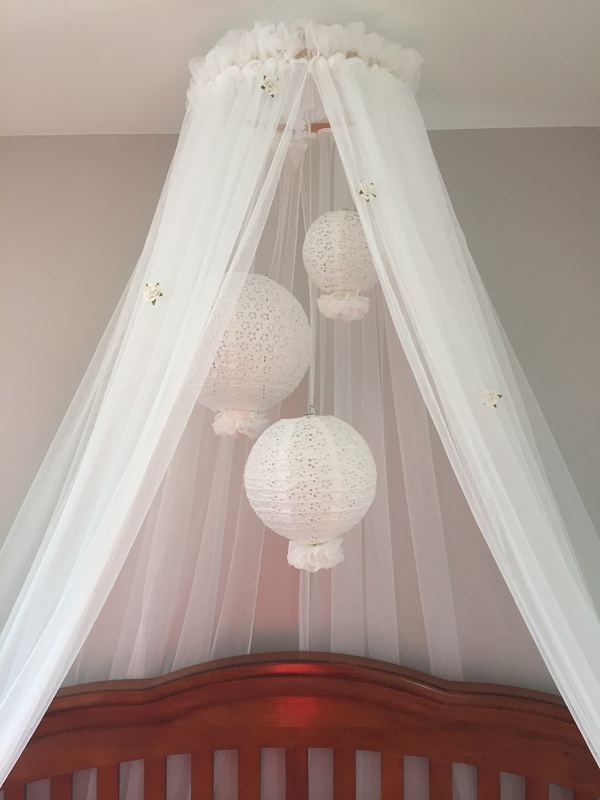 A set of fabric flowers (from Michael’s) to attach to the bottom of the lanterns, which make for nice details for baby to look at. The crystals come attached to the flowers. And floral embellishments (from Michael’s) to glue onto the outside of the canopy, which adds to the whimsical effect. As The Finding Silver Linings blog directs, I slid the curtains onto the outer edge of the hoop. I then cut 6 equal pieces of the lacy ribbon, about 18? inches long (to the best of my memory). I tied each piece evenly spaced on the inner ring, then gathered the ribbon in the center of the ring to tie them all together in a knot, as tight as possible. 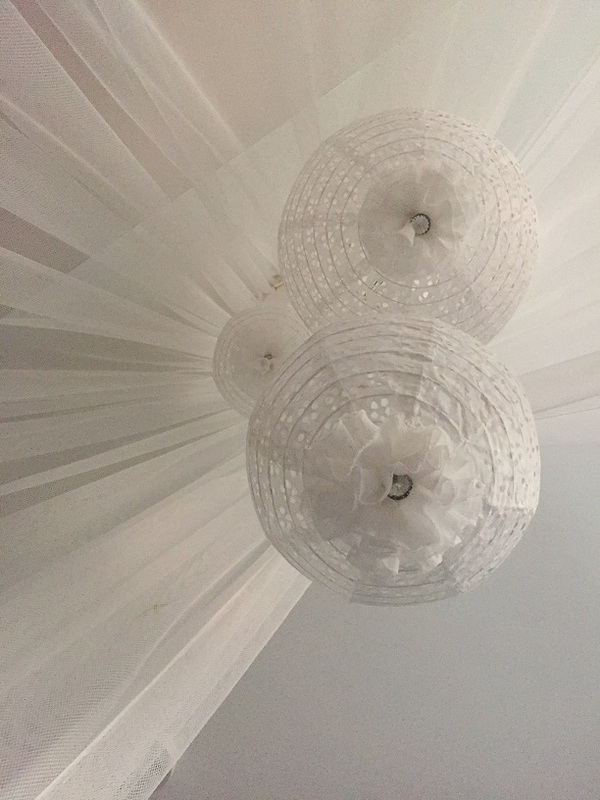 I wanted the canopy ring to sit as close to the ceiling as possible, but you can tie the ribbon looser if you prefer the canopy to hang down a bit from the ceiling. Then I place the inner ring inside the outer ring and tightened the outer ring to secure the two together. Afterwards, I pulled the top of the curtain upwards to maximize the material showing above the ring. 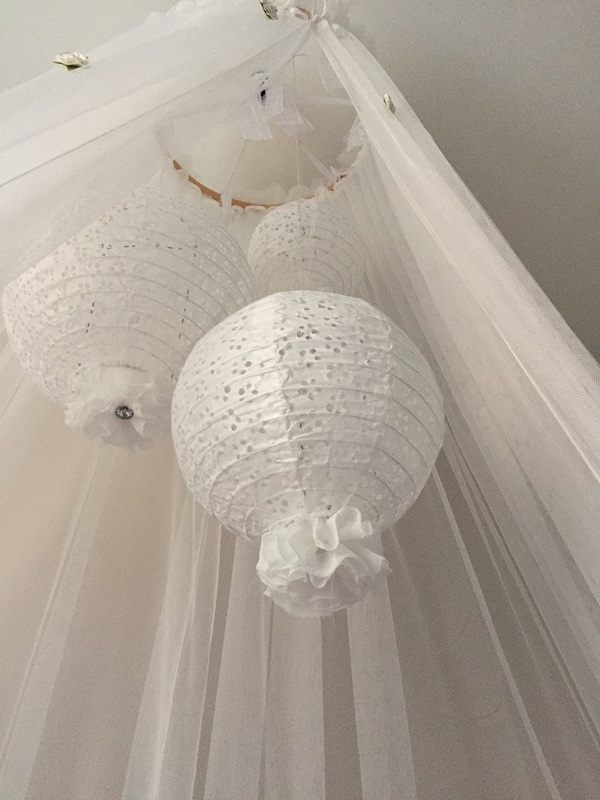 I used sport weight yarn to attach the paper lanterns at different lengths onto the lace ribbon at different points, creating a staggering effect. As I mentioned, we still need to put the finishing touches on the room (changing the bedding, removing the blankets and the bumper, etc. ), but I’m really happy with how the nursery looks so far.